I am back to blogging about our bathroom, but I’m going to write two separate posts on the finished result, so that this one post does not go on for ages. Let’s start with how I re-organized everything! To keep this simple, let’s look back at the organization goals I lined out in this previous post. 2. 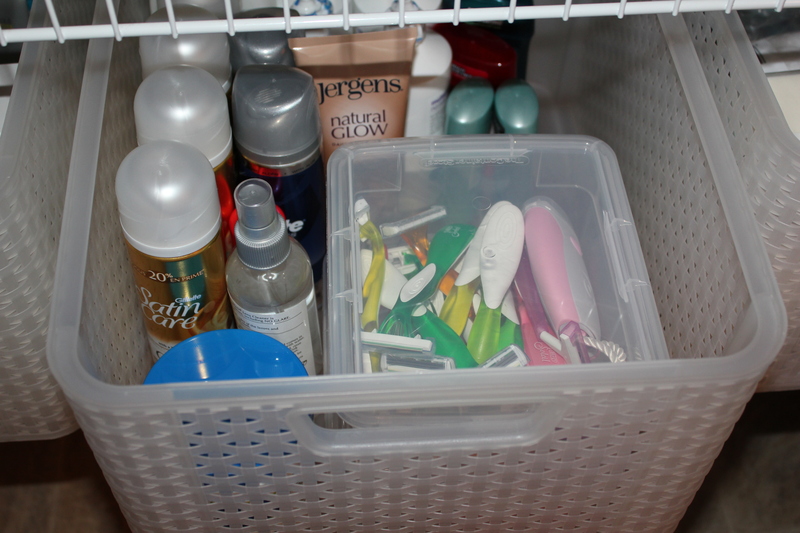 Organize the bathroom drawers. 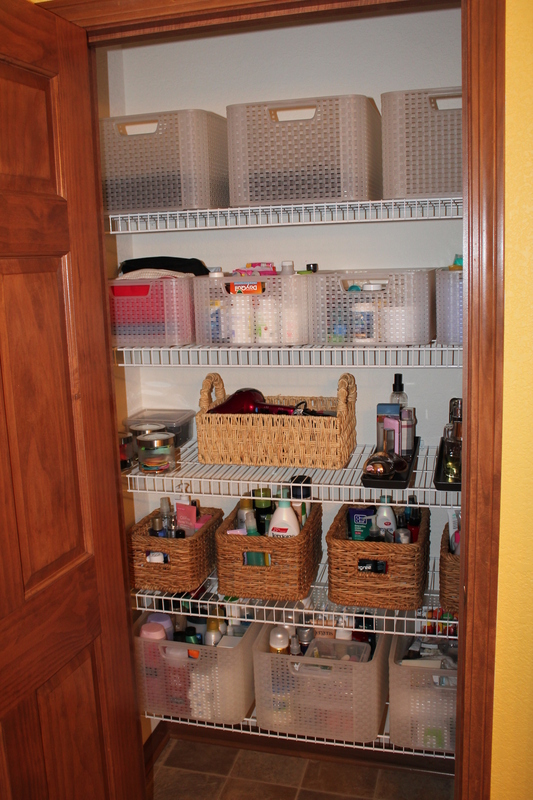 I wanted to find organizers that would fit into the drawers and help keep the odds-and-ends organized and in a specific spot. On a trip to Ikea, we also stopped in at The Container Store. This was my first time in The Container Store, and I had way too much fun. It’s definitely heaven-like for organizational fiends like myself. I found it hard to walk out without purchasing everything in the store! I found these plastic storage organizers (“Bath & Vanity” Organizers! in 5in x 13in x 2.25in and 6in x 12in x 3in–they don’t sell them online so I don’t have a link for you, sorry!) 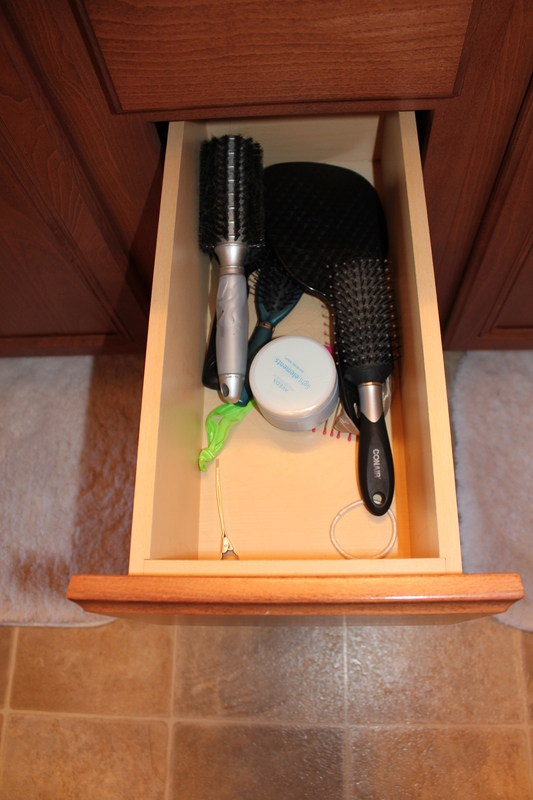 that fit perfectly in our bathroom drawers! 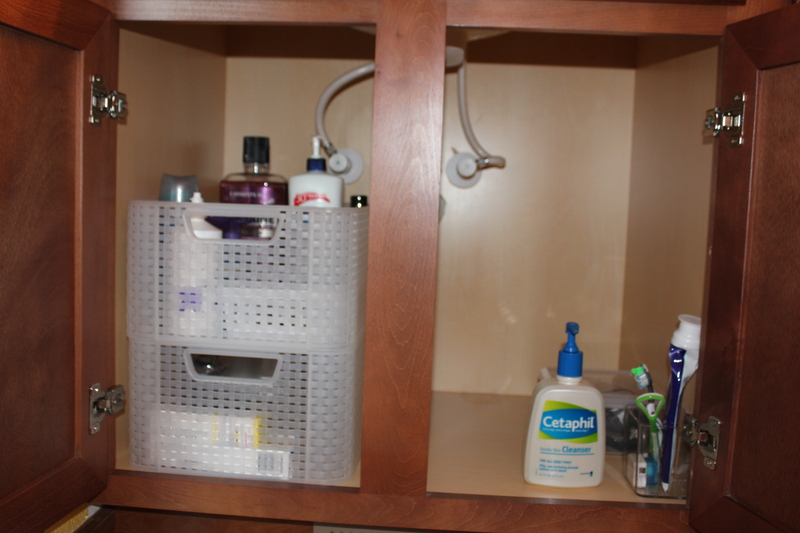 We also have ones with separations in the other drawers to hold things like contact cases, eye drops, little bottles of lotion, etc. They keep everything in its place, which was the goal (unless Maddy pulls everything out, which does occasionally happen! 🙂 )! Each of the organizers (we bought three) were less than $8.00. 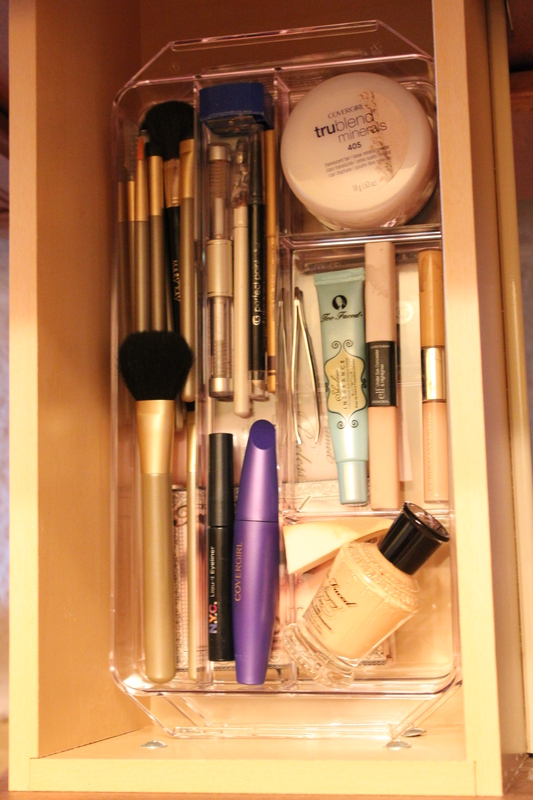 Another perfect solution for my makeup drawer = organizers from Ikea. These are the “Godmorgon” storage unit, set of three. 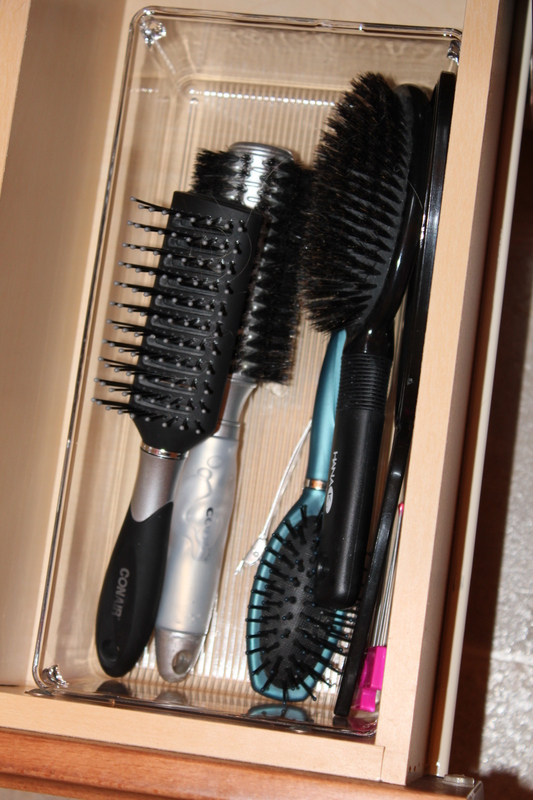 The units keep brushes and mascara in their place, and they are stackable which saves space and is super convenient in a drawer that is deeper, like this one. 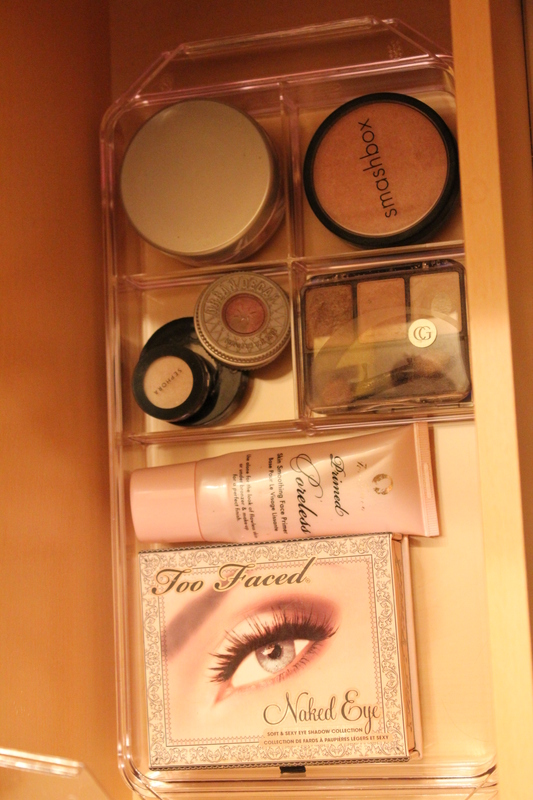 I used to store all of my makeup in a closed plastic container, and it was a pain to get it out and put it away. This is much more convenient and saves me time, which is a necessary thing when mothering a busy toddler! 3. Linen closet. Find matching storage. 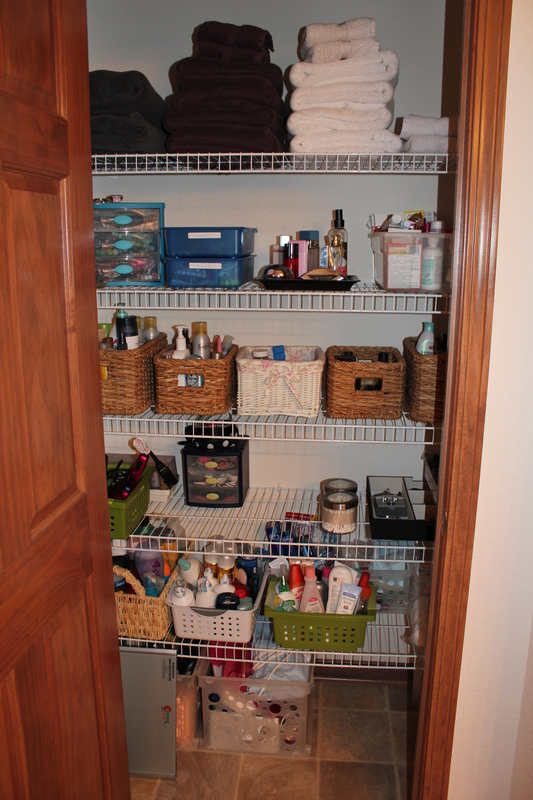 I didn’t like how we had a bunch of different baskets storing things…I felt that even though everything was organized in a basket or container, the mismatched organization made things seem unorganized. We were also not making good use of all the space we had! MUCH better. I got the storage totes, both medium and large from The Container Store. They are the “Curver” brand and again, aren’t available online. However, I have seen them at Target before as well, so maybe you would have better luck finding them there! The medium storage containers were on sale for $9.99 each and the large storage containers were on sale for $12.99 each at The Container Store. The large bins hold a LOT of stuff. We have space to spare in a couple of the bins, which is good, because I like to stock up when health & beauty items are on sale and need to have a place to store them. They are light-weight and easy to wipe out and clean which are added bonuses. I also really like that they are clear-enough that you can kind of see what’s in them, but also not complete see-through, which gives the closet a much more organized look and feel. 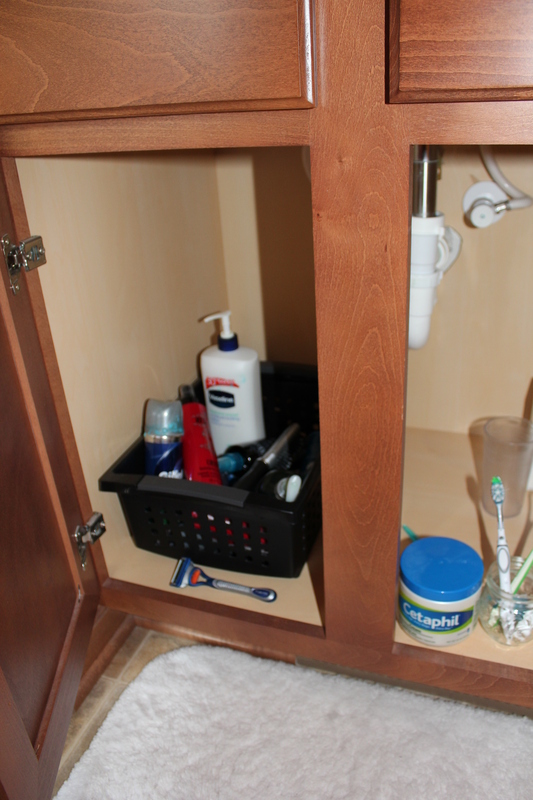 The smaller plastic container with a lid that you see holding the razors in this picture, also came in handy in several spots in the bathroom. These are also from The Container Store and are only $1.69 each! The baskets are from Crate & Barrel. 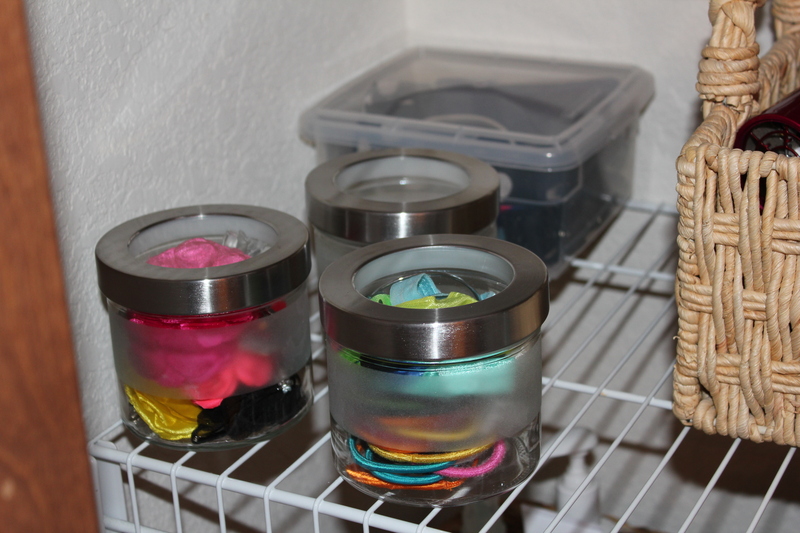 To organize my hair ties and barrettes, I purchased some jars from Ikea. These are the “Droppar” jars and are $2.99 each. 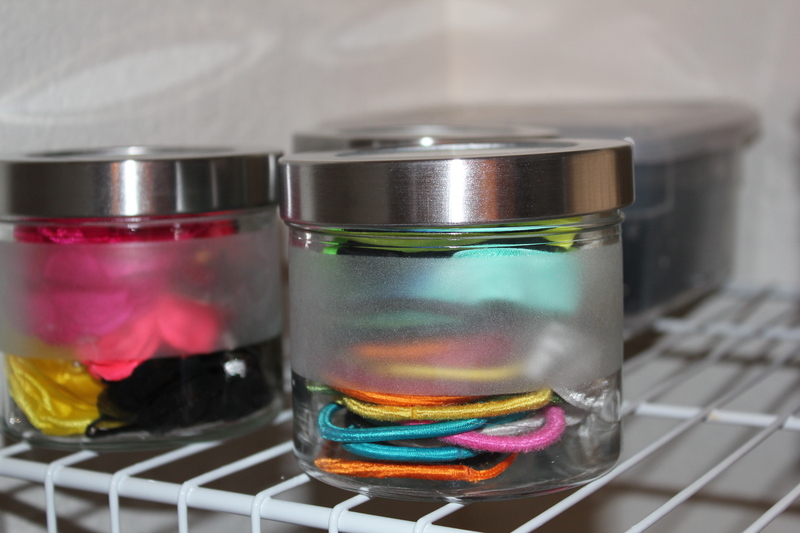 They jars open and close easily and are see-through, making it easy to determine what’s inside. I stored my headbands in another one of the accessory boxes from The Container Store. I wanted something open but still contained to store perfume and cologne. The bottles themselves are often so pretty, so why hide them inside of a container? 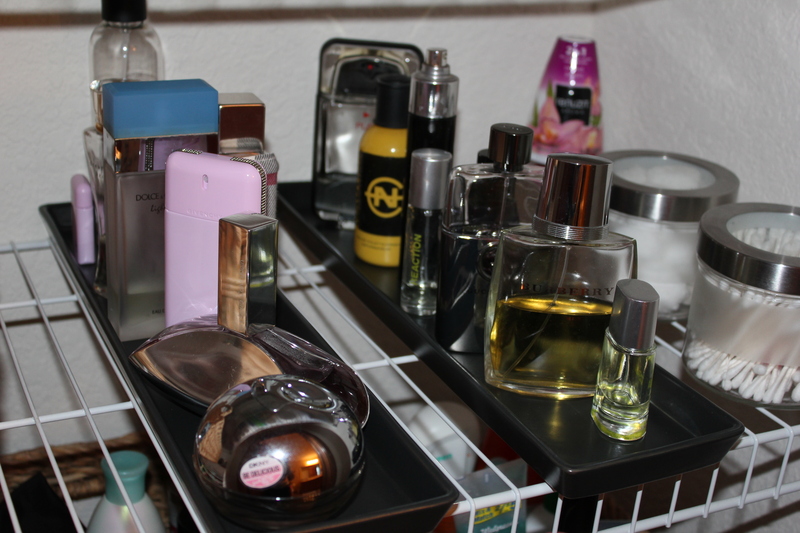 I found these candle dishes for $4.99 each at Ikea, and they are perfect for holding perfume and cologne. We can see exactly what we have and they are easy to grab and use in a hurry. 4. Under-the-Sink Storage. This was a tricky spot to make good use of space. I wanted something with some height that could fill the cabinets but that would also provide us with good storage. 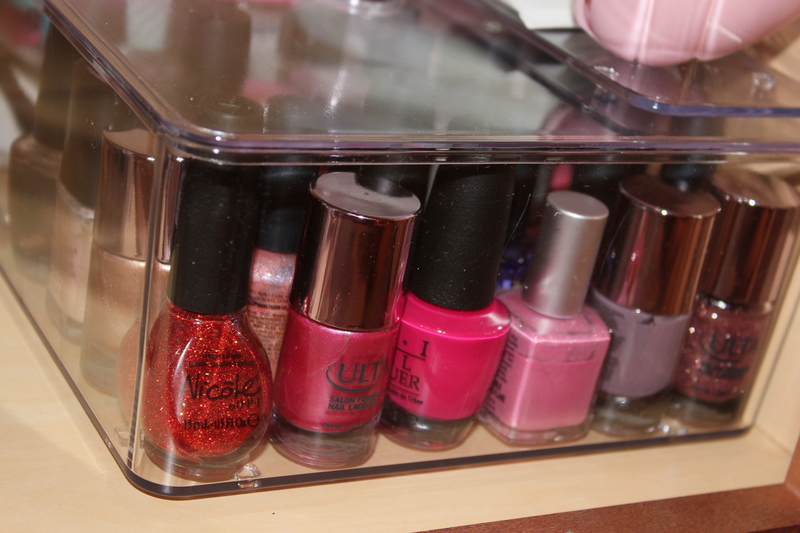 Also under my sink is my nail polish – organized in its new container from Ikea. This container was part of a set of five pieces, that have all found useful places in our home. I love that I can see all of the colors — it is efficient storage and adds some definite pretty color to my cabinet! I will go through and talk about goals #1, 5 and 6 in my next post! See you then! P.S. If there is something that I left out and didn’t mention where I purchased it, don’t hesitate to leave me a comment with your questions!